"Course Folders" are file server shares which provide FAA instructors a place for online file storage for coursework. They are often used by faculty who teach courses that require very large data files to be created by students, turned in, and worked on, for a particular course. Each course folder has five sub-folders, each of which have special access permissions (See "Features"). Course folders are created on a semester-by-semester basis, and are available for extended periods of time (even after the course has ended). This is to allow students and faculty to transfer project files forward, for projects that span more than one semester. Course folders over one calendar year old will be moved to an "Archive" area, which is only accessible to Faculty and some staff; but old course folders in the "archive" area are subject to removal based on the space needs of new courses. The FAA File Server should be used for long-term storage of curriculum-related files, coursework needed for accreditation, and other files needed on a long-term basis. 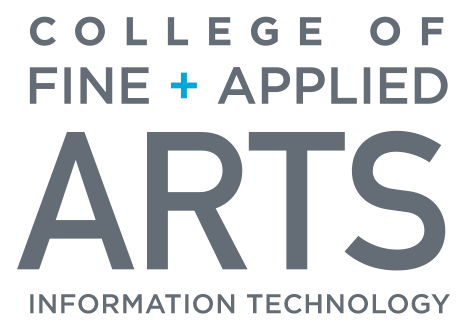 This service is available to all faculty and instructional staff within the College of Fine and Applied Arts. Requests for new course folders are processed Monday - Friday 8:30 a.m. - 5 p.m. Course folders are available 24/7 except during server maintenance. Content within the course folders will kept for one calendar year after the course is finished, and will be archived after that. Archived course folders are subject to deletion based upon storage needs of upcoming courses. Access for students and instructors of the course automatically populated by course roster. Secure backup of files on the server. Staff-Only - This path is for the Instructor(s) only. Students cannot view this area at all. Handouts - This path is for handouts. Students can read, but not modify materials in this area. Instructor(s) have read/write access. Student Folders - This area contains a folder for every student to store private files. Each student may access only his or her folder. Instructors have full read/write access to the folders. Please fill out an IT Request Form, selecting Course Folder Creation as your Request Category. NetIDs of all people who will serve in an instructive role; such as TAs, and other faculty. The CRNs of all courses that will correspond with a particular folder. This is important because some courses are cross-listed and contain the same materials and assignments, etc. An example would be LA460 + ANTH460. Please allow 2 business days for most requests. No installation is needed. However, you must connect to the server share using the proper credentials. At this time, please use your UOFI AD credentials to connect to your course folder. For a tutorial on how to connect to FAA's servers, visit the College of FAA: How do I Connect To a File Server? article. For assistance please contact the Technology Services at FAA Help Desk or 333-1987.